It took Dovid Greenfield of Teaneck just 21 seconds to pin his opponent and win his third straight heavyweight title at the Wittenburg tournament. And the Torah Academy of Bergen County junior wasn’t surprised at all. He’s probably one of the best wrestlers, if not the best, that TABC has ever produced, his coach, Yoni Ellman, told the Standard before the tournament. Ellman added that a Catholic school coach half-seriously asked if he could recruit Dovid. The 16th annual Yeshiva University Henry Wittenberg Wrestling Invitational was held Feb. 18 to 21 at YU in Manhattan. It is named after Olympic gold medalist and Wrestling Hall of Fame and National Jewish Sports Hall of Fame member Henry Wittenberg, who coached at YU. Overall, the TABC team placed second in the Wittenberg tournament, with 216 points, after four years in third place. The Frisch School of Paramus, the 2010 winner, finished third. Ida Crown Jewish Academy of Chicago placed first. Dovid is featured on the YU wrestling site (www.yeshivawrestling.com) for his third-place finish at the Bergen County wrestling championships in January. He also won the Terminator Award there for the most pins in the tournament, six. 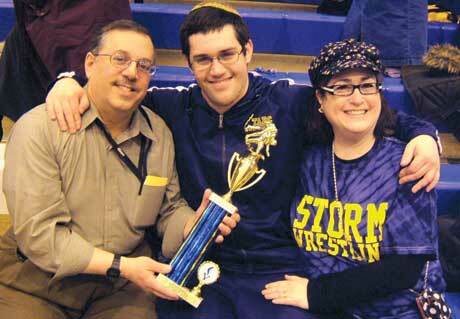 His third-place finish was the best-ever by a yeshiva student at the Bergen County tournament. He plans to continue wrestling through four years of college, although he acknowledges that may be tough for an observant Jew. “I’ll do what I can,” he said. “The only place that I know that’s very open to Jewish wrestlers is Yeshiva University,” Ellman said. The problem is that many college wrestling matches are held on Saturdays. Schools have a limited number of wrestling scholarships, because it’s not a sport that produces revenue, and administrators may not want to use one on a part-time wrestler. “He’s getting to the point where he could be recruited, but obviously, being able to compete would be pretty hard,” Ellman said. “He’d have a better chance of recognition and Division I offers if he wrestled at the state tournament – and that’s on a Saturday,” Ellman told the Standard. There are no efforts at present to get the tournament rescheduled. Amalya Knapp, a 7-year-old observant gymnast from Teaneck, was unable to compete in a state competition on Shabbat earlier this month. And six years ago, TABC’s mock trial team was unable to compete in national finals that were scheduled for a Saturday, until protests led to a change in scheduling. Dovid admits being observant and competing with secular athletes is a challenge. Dovid plans to go to a yeshiva in Israel for a year between high school and college, but wants to attend an American university at this point. Ellman thinks the TABC wrestler is more likely to get offers from Division II and III wrestling programs, which may not have an athletic scholarship to offer him. There’s another challenge for Dovid: Classes at TABC run until late afternoon, followed by mincha services and then, on some days, wrestling practice from 6 to 8 p.m.
“I’m up pretty late,” he said.